I knew from day one I planned Sophia's school party that she would enjoy. And sure, she did. But I never expected I'd get sick. I was constipated and bloated. I kept on releasing gas but no further follow-up, which was such a bad idea. I drank the last sachet of my then-slimming tea (because I have learned to love my womanly body) in the belief that I would have released all there was in me that made me so bloated. Yeah, I won't let you know the gory details 'cause you might be munching on some chocolate bar right now while reading this. And you might hate me forever. So what happened was, I released it! Ta-daah. But annoyingly, I had a fever and suffered from severe headache due to dehydration. Can I just prick myself with a dextrose? So, Sophia didn't go to school today because no one would prep her up. I think she somehow understood her sickly mother's sad situation. She didn't ask for too much of clingy motherhood that I usually offer. She looked like the girl I really wanted her to be - an independent four-year-old. My 4-year-old preschooler was to blame for all of these, eh? No, please, no. It did cross my mind though. But I loved what I did for my little girl and never regretted it. Oh well, I might avail a party pack from Jollibee next year. This party she had was all DIY - from the invites to the loot bags. I even used my own CO2 to inflate all 18 balloons I got from The Shoppe, owned by Misella Badua-Tagorda, my highschool classmate, who is now a proud mommy of a 3-year-old boy. I downloaded strawberry party templates from Sweetly Sweet and used it for the invites and party loot bag labels; instead of those I first saw in One Charming Party. The reason? Those I used from Sweetly Sweet has a touch of pink and has more youthful vibe than one from OCP. 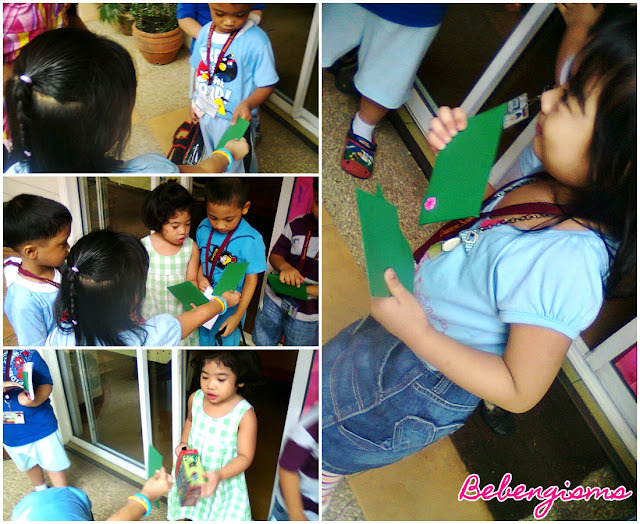 I pasted it on a green paper board and put some whatever-it-was-called art stuff from Ikea, made a flower, then tasked Sophia to distribute it to her classmates. The kids didn't complain about how simple it was. Actually, I think they liked it. Girlstuff Forever giveaway is still up. Join here. It's the loot bag that I think they didn't like. Haha! It was the most selfish loot bag I have ever seen. It only has 3 sweets in it, but hey, the star of the loot bag was the hand sanitizer from Girlstuff Forever. Not only it smells good but it also gently cleanses the kids' hands and doesn't have harsh chemicals; really safe for children. They didn't open it in front of me so I didn't see their reactions. I still hoped they liked it. 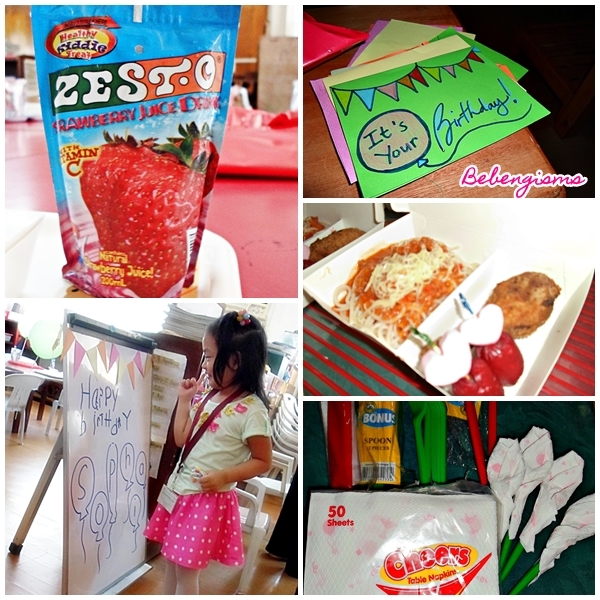 What I saw was the kids' reception towards the food I prepared; spaghetti, chicken, hotdog and strawberry juice. Some ate the creamy spaghetti and hotdog with mallows, but the chicken was completely ignored. Boo. Haha! My sister who went to the school to assist even nonchalantly asked why I gave them strawberry juice as it tastes like cough syrup. I didn't care, the kids finished it. And it's all part of the theme. Hihi. 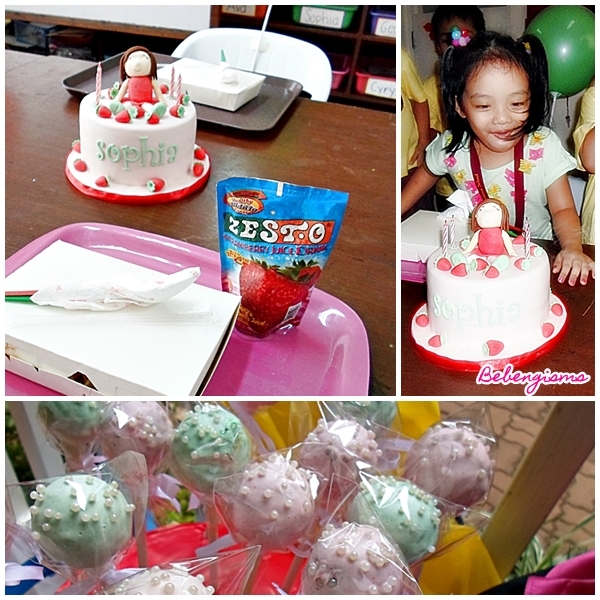 The center of all spectacle aside from the birthday girl was Sophia's cake and cake pops from HummingBread. 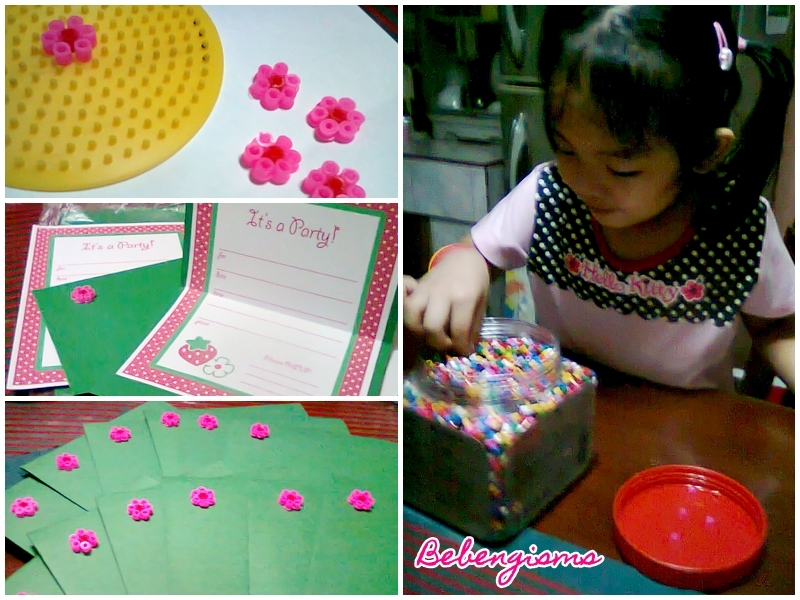 Mommy Grace lovingly created a simple yet oh so pretty 6-inch round fondant cake for my little cake monster. When she warned me that I might not like it because it has to be dense, I really thought it'd have a mamon-like feel into it. Pretty much the cake slices you can buy from Goldilocks. I was wrong. It was still fudge-y and creamy. It was really good. Its bittersweet chocolate flavor greatly matched the strawberry gum paste. The cake pops were magnificent, too. I can't explain my happiness when one of Sophia's classmates finished one in three counts! It is THAT delectable. You should try it. And cake pops are the new addition to party trends. It makes any table festive and it's a great alternative to cupcakes. In totality, the party was a grandiose event for my innocent 4-year-old. She really acted out like a fab party hostess that day. She whined a bit when it was time for games but I made her realize that her classmates won't be happy if they see her sad. And so she went back to her giddy self. 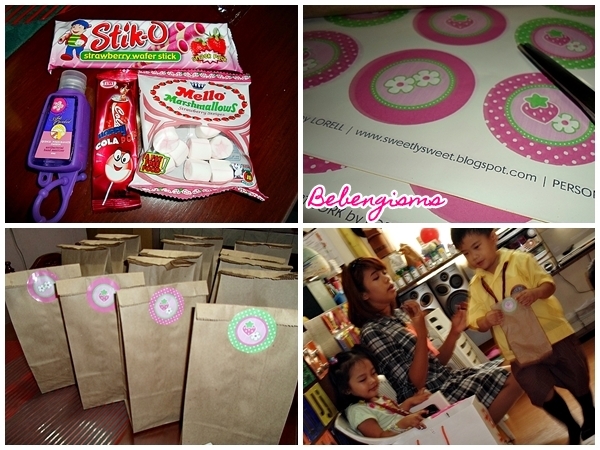 I didn't regret giving her this simple school party as I have seen how delighted she was handing out prizes for the games and the loot bags in eco-friendly brown paperbag. The gifts she received also added to her already sparkly mood. HAPPY BIRTHDAY, MY STRAWBERRY SHORTCAKE! Congratulations Nanay Bebeng! Though you look tired in your photo with Sophia it nonetheless shows the kind of mom you would always be for your child,despite all odds you will be the Nanay Bebeng she would always look up. God bless both of you.